Breast and ovarian cancers are scary, anxiety-provoking diseases, and with good reason. Although breast cancer isn’t the cancer that kills the most women (lung cancer holds that distinction), it is the most commonly diagnosed cancer in women. And ovarian cancer is difficult to find in its early stages. But anyone willing to spit in a tube and pay $199 will soon be able to find out if they have a particular genetic predisposition to either of these cancers. But not everyone is celebrating. Because the gene variants found by the test are extremely rare, most people who take the test won’t come away with much meaningful information, and there’s no good evidence that people who take the test will be better off than those who don’t. What we have is a clash of philosophies: Should consumers have a right to information that some experts have deemed unhelpful and potentially harmful for most people (if it gives a false sense of security to those who test negative or increases anxiety)? Proponents of consumer testing say “yes.” The debate centers on how decisions about genetic testing should be made and who is entitled to a say. One thing that there’s agreement on: The vast majority of women diagnosed with breast and ovarian cancer don’t have any known genetic factors. 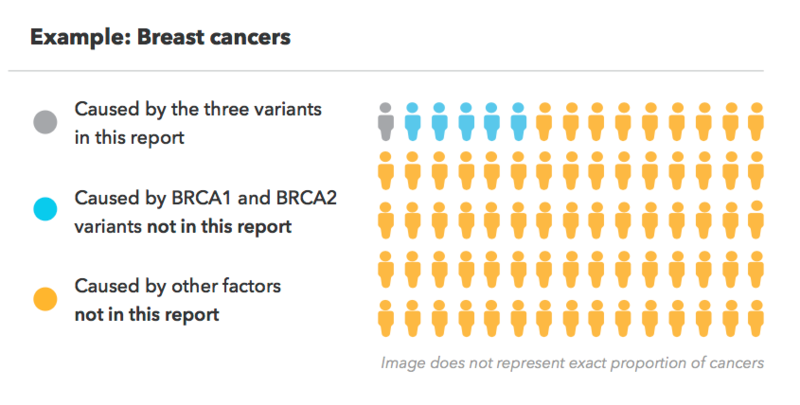 Only about 5 percent to 10 percent of breast cancer cases and 10 percent to 15 percent of ovarian cancer cases3 occur in people with a BRCA1 or BRCA2 gene variant. And the gene variants themselves are rare. The mutations detected by the 23andMe test are present in far less than 1 percent of the general population. They’re more common in women of Ashkenazi Jewish descent, but even then, they still appear in only about two out of 100 of those women. Advocates of testing counter that people are entitled to their genetic information. The 23andMe tests are appropriate for “anyone who wants to learn more about themselves and their potential health risks from their DNA,” said Shirley Wu, director of product science at 23andMe. And to ensure that there’s no confusion, the FDA mandates that 23andMe be clear about the limits of the test — what it can and can’t tell you. Here is an example of some of the information presented with the test results. Anne Wojcicki, the CEO and co-founder of 23andMe, wrote in a blog post about the new test that even though there aren’t many carriers of BRCA1 or BRCA2 mutations, some women who could benefit from screening aren’t getting tested. And even if the test doesn’t change what you know about your cancer risk, Wu said, “the results can still inform your conversations with your doctor.” She said that getting a negative result on the test doesn’t mean someone should stop any healthy behaviors or screening that they would normally be doing. Just getting a genetic test helps educate and engage people in their health, she said. There’s ample evidence to show that genetic risk information does not change behavior, said Timothy Caulfield, who is the research director at the Health Law Institute at the University of Alberta and has studied the use of genetic testing for health promotion. For instance, one study found that giving people information about their genetic risk for developing type 2 diabetes did not change their health behaviors. And simply providing information isn’t enough to make a test useful, said Rita Redberg, a physician at the University of California San Francisco and editor of JAMA Internal Medicine. “There has to be some data to suggest that people are better off having had the test than without it, and I don’t think those criteria are met here,” Redberg said. The variants may also boost the risk of prostate cancer and melanoma. According to the National Cancer Institute, women with one of the many known harmful variants of BRCA1 have a 72 percent chance of developing breast cancer by age 80 and a 44 percent chance of getting ovarian cancer. For people with a BRCA2 mutation, those percentages are 69 percent and 17 percent, respectively. The BRCA1 and BRCA2 genes also play a role in approximately 15 percent to 20 percent of male breast cancers.